Rust Droid is a administrations and monitoring app for Rust. Manage your Rust servers on your device and keep up-to-date. Control your server wherever you are. 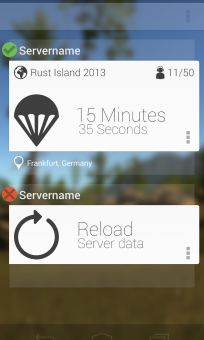 With RustDroid you do not need to sit in front of you computer to handle player requests or kick cheaters. Download our app and have full control, even when you are not at home! At first there was an issue with connecting to my server but after back and forth emailing with devs we got it working and they were quick to respond and come to a solution, they were a big help. Other than that the app is a great tool to manage you server on the go. Recommended to everyone with a rust server. The app is pretty clean and connects fine with my server. I look forward to it continued development. Fürs erste is es super geworden! Kann jetzt hackers unterwegs bannen. Danke sehr.